This week’s post is the second in a three-part introduction to the formal language of energy, as a foundation for subsequent discussion about just what it is that the energy concept deals with. These posts are intended to provide a set of reference points for later inquiry into the higher-level relationships between energy and societal futures. A central purpose of the approach I’m advocating is to maintain a connection between our understanding and use of energy-related concepts, and day-to-day experience of our physical world. It’s my contention that we might then be better placed to appreciate and respond to the societal dilemmas we’re confronted with through clear eyes—as free as possible from the fog of confused conceptions. In Part 1, I presented an introduction to systems ideas as a way of thinking about any situation in which we’re interested, and then went on to introduce energy law 1, the law of energy conservation. This was the first of three foundational energy laws that this three-part series lays out. In Part 2, I introduce energy law 2, relating to energy dispersal. This will pave the way for Part 3 next week, in which I’ll look at energy law 3, sometimes paraphrased as the ‘economy law’. 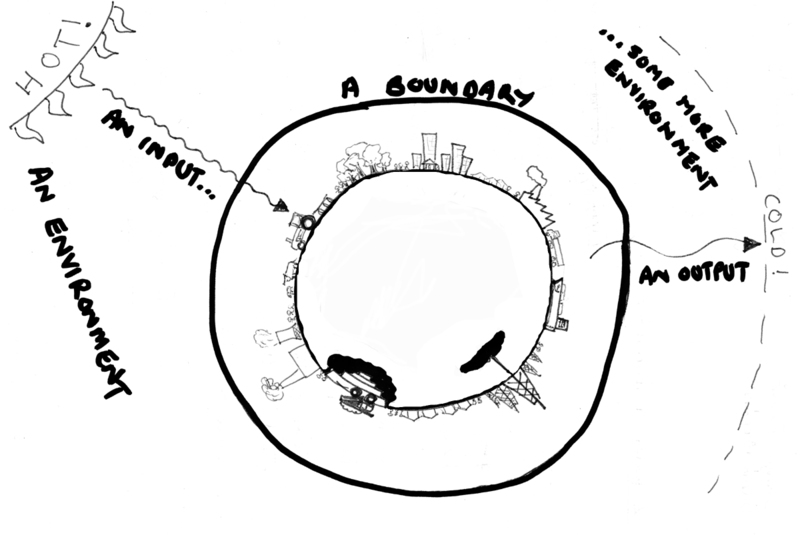 Drawing on the last phase of the example introduced in Part 1, the very simple chair-floor-bottle system with a single degree of freedom, we’re now in a position to set out the second major law governing energetic behaviour of systems: energy tends to disperse or spread out in space from being more locally concentrated to being less concentrated, unless there’s no physical pathway available for doing so. This is a very general description of the physical behaviour that the second law of thermodynamics deals with. As with the energy conservation law, this sets a bedrock constraint to which all possible future states of any system that we care to conceive—whether physical, biological or social in nature—are subject. In other words, energy laws 1 and 2 describe limits to the possible evolutionary pathways for all situations. We can now make some further observations about the distinction between kinetic and potential energy by noting that the concept of potential energy relates to that portion of a system’s internal energy subject to a temporary—though possibly indefinite—pause in dispersal from being more concentrated to more spread out or uniformly distributed. This spreading out always occurs via the kinetic energy associated with the larger-scale motions of the system’s components (think of our bottle falling from the chair to the floor) being transferred to smaller-scale motions of the system’s components (e.g. increased vibration of the atoms comprising the side wall of the bottle, observed by us as an increase in temperature). So there’s an overall dispersal of kinetic energy from aggregate motion of the system’s components at coarser scales to disaggregated motion at finer scales. Expressed slightly differently: wherever a system’s internal energy is concentrated relative to the system’s surrounds, energy will eventually spread to the surrounds until equilibrium between system and surrounds is reached, unless this is prevented by temporary disruption of the dispersal process due to a system configuration that resists this dissipative cascade i.e. configurations in which interactions between system components or system and environment can be considered ‘loss-less’ and hence in which energy is held in potential. (Note though that a net dispersal from system to environment occurs where there is no process happening simultaneously that further concentrates energy in the system.) With reference to our simple example, the chair-floor-bottle system configuration in which the bottle is sitting on the chair can be considered loss-less—work from outside the system being required to displace the bottle sideways in order to initiate the energy dispersal process of the bottle falling to the floor. The net result of the dissipative cascade from kinetic energy at larger scales to kinetic energy at smaller scales is that all energy tends towards what we know colloquially as heat (more correctly, thermal energy)—energy associated with the atomic-scale motion of matter. This is, if you like, the ‘grave yard’ for energy: after the capacity for doing work or transferring heat is ‘used up’—where there are no further concentration gradients along which to disperse (the systems with which the energy is associated are at their lowest possible temperature)—we can conceptualise energy as playing out the remainder of its ‘eternal existence’ in the form of these atomic-scale motions, with motions being of the lowest possible speeds. Equipped with these conceptual tools, we’re now well placed to tie all that we’ve looked at so far to a more complex example—and one perhaps more immediately recognisable as relevant to this overall project. In fact, let’s use the tools to sketch out a very brief history of the macro-scale situation from which this blog derives its name and purpose. The four conversion pathways in this diagram together account for more than 90 percent of global total primary energy supply; of this, paths 2 & 3—the fossil fuel paths—make up over 80 percent. The coal, oil and gas deposits became fuels in the context of social arrangements, techniques and infrastructures that enabled their exploitation for human purposes. Prior to this, the potential energy associated with them was, in relative terms, locked-up—it had very limited dispersal pathways available. Over time, some would occasionally come in contact with the atmosphere, where it could combust given appropriate conditions, converting potential energy to kinetic energy. Heating of the immediately surrounding environment would result, representing a local concentration of thermal energy. This in turn would disperse outward, leaving the Earth’s surface for surrounding space as long wavelength thermal radiation, and bringing the local environment into thermal equilibrium with its surrounds. The overall rate of dispersal was, in human historical terms, extremely low. Nonetheless, on long enough time frames, if the rate of accumulation of new deposits remained below the natural rate at which existing deposits broke down, all of the accumulated potential energy would eventually disperse as kinetic energy. For all but the past few hundred years of human history, most heating and almost all work (the exception mainly being the relatively small amount that was wind or water-and-gravity powered) was fueled directly by contemporary plant and animal matter. The prime movers for the work carried out by human societies were animals and we humans ourselves—and the rate at which work could be done was limited by, amongst many other practical and institutional constraints, the rate at which food could be made available. With the advent of human arrangements in which the deposits of plant and animal remains from the distant past became socio-economically valuable resources—initially via pre-industrial use of peat and coal for heating, and then, with the rise of the industrial age, the use of these plus oil and later gas both for heating and for doing work—the scene was set for an extremely rapid and massive-scale shift in this situation. In parallel with the comparatively meagre natural dispersal pathways for the potential energy associated with coal, oil and gas, we initiated a techno-economic bootstrapping process to grow a globe-spanning network of industrial dispersal pathways. Dispersal of fossil fuel potential energy—as the kinetic energy of human industry—itself enabled expansion of the infrastructure to disperse that potential energy at increasing rates. With this, we had on our hands a planetary scale run-away feedback process, the likes of which humanity had not previously set in motion anywhere in its multi-hundreds of millennia evolutionary history, even temporarily on the most local scale. At this point in our history, it seems increasingly remiss to simply assume that this brief anomaly might continue much longer, let alone ever be repeated—as illustrated so poignantly by this graph in a post by Tom Murphy at Do the Math. Moreover, for the vast swathe of planetary and human history over which natural dispersal pathways governed the rate at which the cascade from potential to kinetic energy could occur, combustion of coal, oil and gas played a comparatively tiny role in influencing the Earth system’s thermal signature—the global mean temperature needed to drive radiant heat transfer between the planet’s surface and surrounding space. Today, following changes to the Earth and its atmosphere as fossil potential energy has dispersed as kinetic energy via our industrial pathways, the global mean temperature required to maintain the balance between incoming short wavelength sunlight and outgoing long wavelength radiation is increasing. And while changes to the atmosphere are the predominant driver of this, the direct heating of the Earth system as a result of burning these fuels so rapidly is itself not entirely insignificant. The overall effect is that our rapid exploitation of this one-time fossil fuel windfall is resulting in a net increase in the micro-scale kinetic energy of our Earth system’s surface and atmosphere. In dispersing fossil fuel potential energy, the mean speed of the Earth system’s components has increased very slightly; the system’s activity has increased. In overview then, considered from a systems perspective we have a situation in which exponential growth in the pathways by which our system’s potential energy can disperse as kinetic energy have resulted in the rate of dispersal also increasing exponentially over several hundred years; those dispersal pathways are themselves enabled by energy previously held in potential spreading out as kinetic energy, as energy of motion; by multiple causal routes, this is leading to a two-fold dilemma in which i) the kinetic energy of the system is rapidly increasing with detrimental implications for the established norms of the system components most fundamental for systemic health and ii) the potential energy of the system is rapidly depleting with detrimental implications for the established norms of the system components most significant for systemic health. My summing up of this second branch of the dilemma may well be contentious, and is of course debatable. The point is just to recognise for now that with this second branch, our concern is primarily with the sustenance of our valued human capitals; with the first branch, it is both our natural and human capitals that we place at risk. This is a subject that we’ll take up in greater detail as the inquiry unfolds in coming months. For now, it’s a few steps beyond where I’d like us to focus. To wrap up this post, a further note on our systems theme is warranted in relation to potential energy: recognising energy as being held in potential is very much dependent on our own human capacity for identifying the possible pathways by which dispersal as kinetic energy could occur. Indeed, there is no potential energy associated with a system in the absence of such pathway identification. For these pathways to be defined they must be part of the system—and as we’ve seen, what counts as a system is a matter of our definition. So for instance, the energy associated with the reactive chemicals in a battery only contributes potential energy to a system’s total internal energy in a situation where it is part of an appropriate electrical circuit. Superficially, it might appear that a charged battery placed within the boundary of our chair-floor-bottle system from earlier increases the internal energy by an amount equal to its chemical potential. Our system though provides no way for this energy to disperse as kinetic energy (neglecting for now the propensity of all batteries to discharge ‘on the shelf’ with time). My point here is just to underscore again that what counts as a system in relation to the energy concept is a matter of definition on our part—in this sense, we are always part of the situation of interest! We’ve now covered sufficient ground to bring in the third and final of the foundational or governing energy laws that I’m introducing in this series of posts. I’ll take up that task in Part 3 next week. 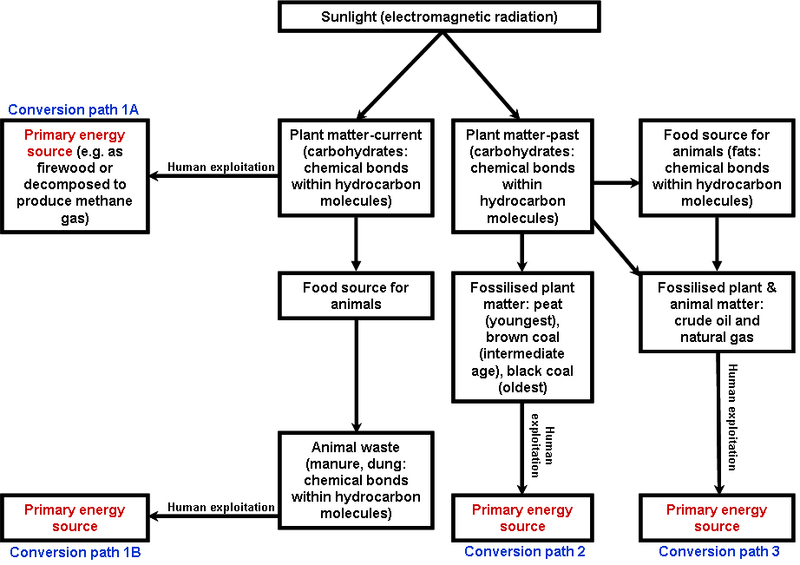 This entry was posted in Foundational ideas and tagged conservation, dispersal, energy laws, systems view by Josh Floyd. Bookmark the permalink.